This chapter discusses one of the most relevant and straightforward application of connected cars—connected parking. Everybody who is driving a car has had some experience with the difficulty to find a parking space and to park the car in narrow lots. Fortunately, technology is available to help, and it will potentially have a major impact on traffic, parking accidents, and space utilization in cities. After a brief discussion of parking from a business perspective in Sect. 10.1, analyzing the main challenges, the chapter discusses the opportunities for connected parking in Sect. 10.2. A multitude of new apps provides information, often in real-time, about available parking spaces; manages the booking; often allows for cashless billing; and can be integrated with OEM’s connectivity services. This chapter gives an overview of major players and discusses the core features and services of their solution. Section 10.3 presents parking assistance systems. The most sophisticated—as of today—automates the complete parking process; however, the driver still has to be in the car and has to oversee the process. The next step, automated valet parking (AVP), is discussed in Sect. 10.4. AVP systems turn the vehicles into a robot car that automatically finds parking space and maneuvers the car into a free slot. The first commercial systems will soon be available in high-end cars, soon, and also will be deployed for carsharing. Sections 10.5 and 10.6 deal with the cybersecurity impact of connected parking and automated valet parking analyzing the major cyber threats and look at potential solutions for increasing the cybersecurity, like intrusion detection and prevention (see also Chap. 6). 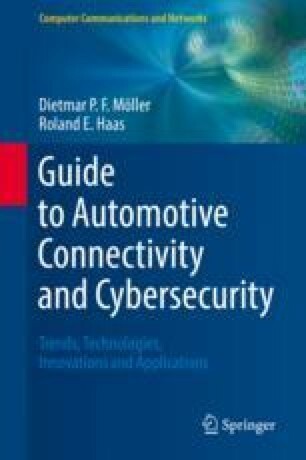 Such systems are in place to protect large-scale IT infrastructure and recently have been applied to the cybersecurity of vehicles, which is discussed more in detail in Chap. 6. Section 10.7 finally wraps up with a conclusion and recommended further readings. Section 10.8 contains a comprehensive set of questions on the connected parking and automated valet parking and the final section includes references and further readings.